Joint plots are useful for machine learning on multi-dimensional data, allowing for the visualization of complex interactions between different data dimensions, their varying distributions, and even their relationships to the target variable for prediction. The Yellowbrick JointPlot can be used both for pairwise feature analysis and feature-to-target plots. For pairwise feature analysis, the columns argument can be used to specify the index of the two desired columns in X. If y is also specified, the plot can be colored with a heatmap or by class. For feature-to-target plots, the user can provide either X and y as 1D vectors, or a columns argument with an index to a single feature in X to be plotted against y.
Histograms can be included by setting the hist argument to True for a frequency distribution, or to "density" for a probability density function. Note that histograms requires matplotlib 2.0.2 or greater. The axes to plot the figure on. If None is passed in the current axes will be used (or generated if required). This is considered the base axes where the the primary joint plot is drawn. It will be shifted and two additional axes added above (xhax) and to the right (yhax) if hist=True. Determines what data is plotted in the joint plot and acts as a selection index into the data passed to fit(X, y). This data therefore must be indexable by the column type (e.g. an int for a numpy array or a string for a DataFrame). If None is specified then either both X and y must be 1D vectors and they will be plotted against each other or X must be a 2D array with only 2 columns. If a single index is specified then the data is indexed as X[columns] and plotted jointly with the target variable, y. If two indices are specified then they are both selected from X, additionally in this case, if y is specified, then it is used to plot the color of points. Note that these names are also used as the x and y axes labels if they aren’t specified in the joint_kws argument. The algorithm used to compute the relationship between the variables in the joint plot, one of: ‘pearson’, ‘covariance’, ‘spearman’, ‘kendalltau’. The type of plot to render in the joint axes. Note that when kind=’hex’ the target cannot be plotted by color. 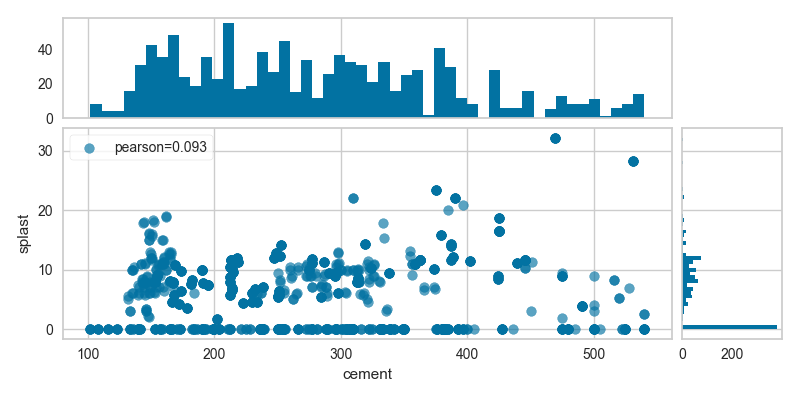 Draw histograms showing the distribution of the variables plotted jointly. If set to ‘density’, the probability density function will be plotted. If set to True or ‘frequency’ then the frequency will be plotted. Requires Matplotlib >= 2.0.2. Additional keyword arguments for the plot components. The correlation or relationship of the data in the joint plot, specified by the correlation algorithm. Draw the joint plot for the data in x and y. The labels for the x and y axes. Finalize executes any remaining image modifications making it ready to show. If self.columns is None then X and y must both be specified as 1D arrays or X must be a 2D array with only 2 columns. If self.columns is a single int or str, that column is selected to be visualized against the target y. If self.columns is two ints or strs, those columns are visualized against each other. If y is specified then it is used to color the points. This is the main entry point into the joint plot visualization. An vector or 1D array that has the same length as X. May be used to either directly plot data or to color data points.